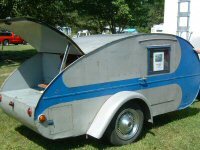 Hello to All,....I'm building a "Weekender" Teardrop with single walls (no Insulation). I'm looking for a supplier of windows and ceiling fan /vent...Would appreciate and comments or refferals on this matter. I'm partial to the windows that Lil Bear (Grant) has. I've used both the 12 x 18's and the 15 x 18's. I prefer the larger ones. They crank out from the bottom. The advantage for me is...I can have them full open in rain and don't get any inside like possible on a slider window. It's also more typical in design for what a vintage tear had. I also radius the corners on them. I've used Fantastic fans in all my builds. 3 speed and 2 directions. They are also available with a thermal sensor and remote control. I don't use any of that however. There was some discussion recently on the noise, but it doesn't bother me. Not that loud in my opinion. They move a lot of air and when on the exhaust setting, draw a ton of air in through the windows. I've slept in the tear with the dog inside in temps/ humidity that we had in Minden in 05 with the doors closed and was fine. I agree with Doug on both counts. I used Grant's windows and the FanTastic Vent as well. Dean_A wrote: I agree with Doug on both counts. I used Grant's windows and the FanTastic Vent as well. It's true, I have the windows from Grant and the 3 speed reversible Fantastic Vent. I do not find the fan too noisy either. Haven't started my build, but am collecting parts. I purchased windows from Grant and the Fantastic vent fan from Adohen - the company MJ recommended. Service from both were great. By the way, if you are planning an aluminum roof skin, Adohen can get the Fantastic vent fan in the "Airstream Gray" exterior color. This is advertised on their website. I think, thought, that this color limits you to the standard dome rather than the flat dome.